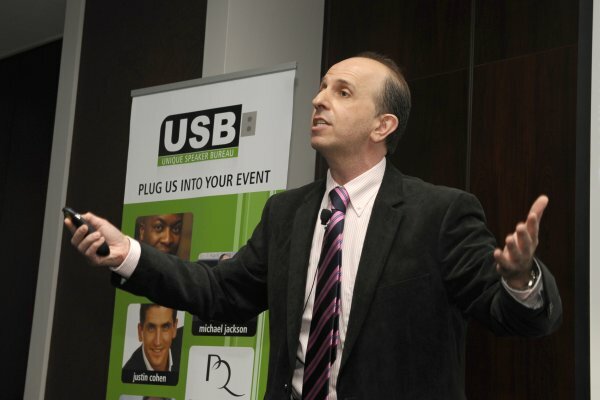 Daniel Silke is a Political Analyst, Futurist & Keynote Speaker specialising in Global Future Trends, International, African & South African politics. 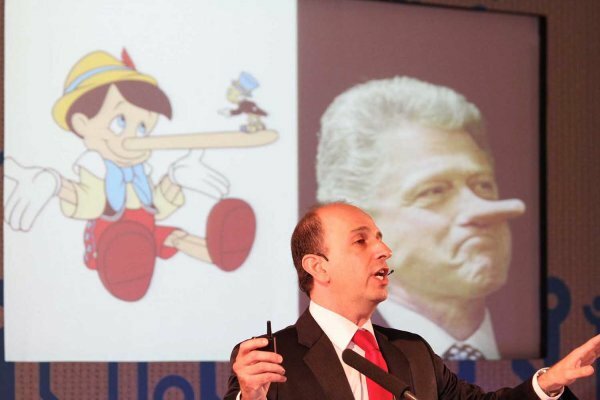 He has lectured widely on issues surrounding the future of the world in over 50 countries. He is the author of the acclaimed new book "Tracking the Future' and is renowned for insightful, analytical & dynamic global keynotes on political, social & economic trends. Mr Silke holds a Masters degree in International Politics from the University of Cape Town, South Africa. Mr Silke has served six years in publicly elected office between 1995 and 2001. He has served four years as a Member of Parliament in the Western Cape Provincial Parliament in Cape Town, South Africa after being re-elected in 1999. He has held the Chair of the Parliamentary Standing Committee of Economic Affairs and has been Chief Whip for his political party. He is also a former City Councillor in the City of Cape Town having served on that city’s Economic Development Portfolio Committee. Mr Silke was attached to the Institute for the Study of Public Policy at the University of Cape Town for five years. Mr Silke contributes widely to publications both in South Africa and overseas. He currently writes for the Australian Quarterly published by the Australian Institute of Policy & Science in Sydney. Mr Silke has co-authored academic chapters in publications on South African politics and is often published in major newspapers and online. His press comments are regularly quoted in publications across the world. 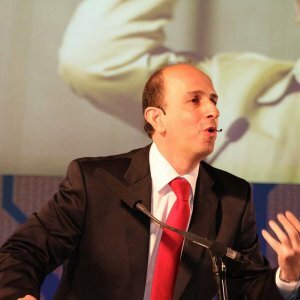 He is a regular guest commentator on CNBC, E-TV and the SABC and is often heard on Radio France International, the Canadian Broadcasting Corporation and many other leading broadcasting networks. Mr Silke recently completed a semester at Lynn University in Boca Raton, Florida where he participated in the Dialogues of Innovation lecture series. He was the Rooney Visiting Scholar at the Robert Morris University in Pittsburgh, Pennsylvania. He has presented to the Financial Planners Association of Australia in Sydney and has lectured to the prestigious World Affairs Council & the American Committee on Foreign Relations. He has delivered presentations at Duke University (North Carolina), Macquarie University (Sydney, Australia), the Philadelphia Bar Association and many others. His client list includes Standard Bank, CISCO, Microsoft, Grant Thornton, FirstRand, FNB, Mercedes Benz, Price Waterhouse, Deloitte's & Alexander Forbes. Do you know the future of the World? Get ready for a thrilling ride! As the world emerges from a dramatic financial crisis, key trends are emerging that will influence all our lives – for some time to come. 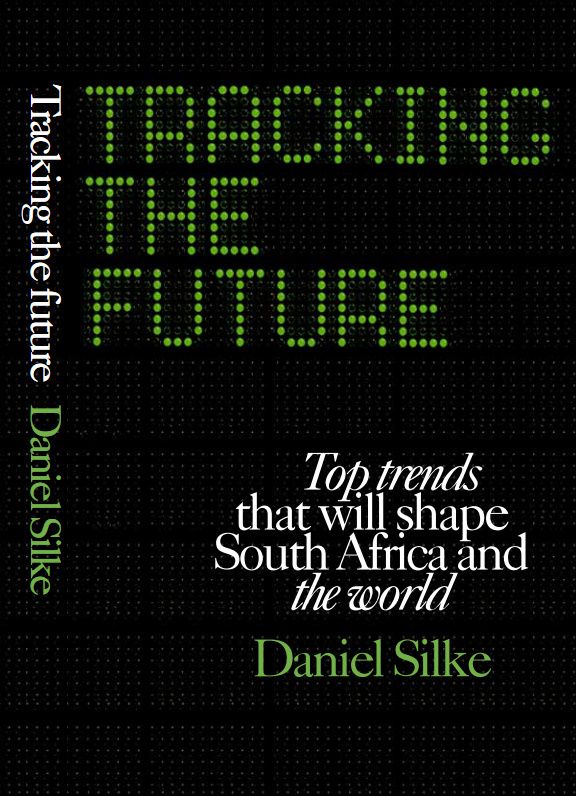 Political Analyst & Futurist Daniel Silke presents a compelling and challenging new analysis of the top global trends that will transform the world over the next four decades. Silke identifies key areas of dramatic change that will affect all our lives – as individuals, in society or in the business environment. Some of these changes are already here – and many more are coming at a ferocious speed. Power shifts towards new developing and emerging nations will alter our mindset. A new Industrial Revolution is with us – this time regionally defined towards new economic hubs. Business practice, the changing work-place, technology and dramatic demographic shifts all conspire to createThe World 2.0 – a new way of understanding a shifting planet and its human practices. This presentation will identify and explain these changes in an all-encompassing talk – fully illustrated, customizable and not to be missed. It is designed to inform and entertain – and no two lectures are ever the same. Nor will be your thought patterns after this one! 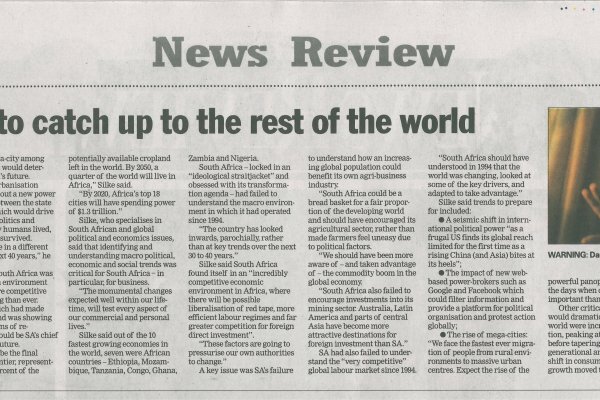 Africa today might be regarded as the final frontier for investment. Languishing for too long under the effects of colonization and corruption, the continent is fast emerging and is ready to take on the challenges of a globalizing world. In this new presentation, Political Analyst and Futurist Daniel Silke takes a look at some of the critical issues facing the continent into the future. This keynote will look at relations between Africa and the West; the growing influence of the Chinese on the continent; food production and the loss of arable land to foreign entities; the scarcity of skills; the growth of cities and their influence, the rapid rise of the African consumer, communication & technology, entrepreneurship as well as regional governance, co-operation and prospects for democracy. An essential guide to contemporary issues facing the African continent. South Africa finds itself at a political and economic crossroads. The essence of the goodwill achieved in the drafting of our new constitution in 1994 is being questioned by the rise of a dramatically altered vision for our economic future. And, with President Zuma fighting for his own political survival over the next 18 months, this period in the country’s history is likely to be fraught with uncertainty, unease and intense political debate. 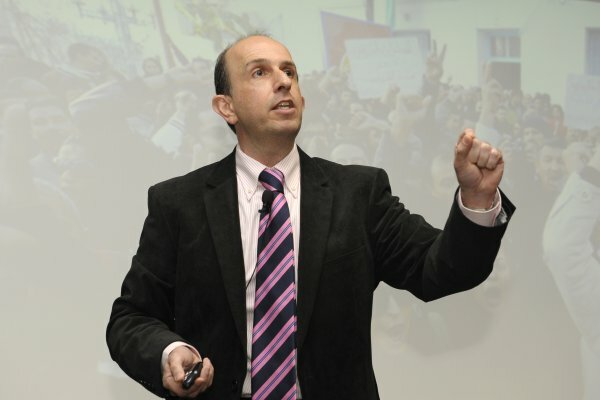 With his usual deep insights, analytical flair and entertaining delivery, Independent Political Analyst Daniel Silke tackles the coming political upheavals in a rational and coherent fashion – explaining the context for the looming debates and providing an understanding for the way forward. Silke’s latest analysis will cover the debate over Nationalization and its likely impact on national policy; the effect of proposed changes in labour & land-related legislation; the latest trends in the domestic economy; South Africa in a changing global context; the question over whether South Africa’s political future will in any way emulate that of the popular protests found in North Africa as well as a crystal-ball look at whether President Zuma can survive to lead the ANC for another five years. This Keynote is clearly one of the most comprehensive and important currently offered to the corporate and convention market. Although not someone to gloss over the real challenges facing the country, Silke’s analysis is timely and provides an essential underpinning for business in the country going forward. Not to be missed. This is the Emerging Markets Century – and the countries to watch are the BRICS nations: Brazil, Russia, India, China and now South Africa. 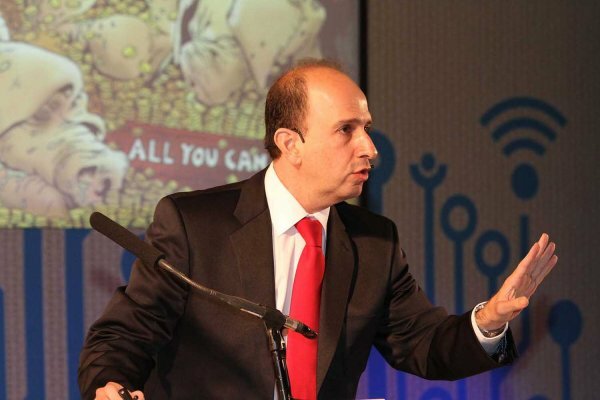 Political Analyst & Futurist Daniel Silke identifies these five emerging super-powers which are set to dominate global affairs for the rest of our lifetimes. Their growing economies, population, skills and political clout make them all highly influential in almost every aspect of life. And Africa too, as a continent, holds out much promise as it also becomes a vital developing region and stakes its claim to recognition & investment. Delving into the fortunes of these nations Political Analyst and Futurist Daniel Silke identifies the key political, economic and demographic dynamics of these growing societies. And, he also identifies Africa as an important addition to this debate. How these societies & regions interact and progress will change the future of finance, business & politics in the world. How global political, social & economic trends influence & drive the discerning consumer. The world is changing rapidly and the consumer of the future is upon us. In this important and timely presentation, Political Analyst & Futurist Daniel Silke identifies a series of key social, political and economic trends and shows how these trends will affect every aspect of the customer experience in the years to come. The presentation will look at how consumers are changing their thinking patterns after a recession and are becoming much more discerning in their demands and choices. In addition, the effect of a growing developing world; the rise of China, India & Africa; new powerful multi-ethnic groups; demographic changes; technology and protecting the planet now all play a vital part in the psyche and behaviour of consumers. This unique presentation is ideal for any conference dealing with sales and future change. It aims to make participants aware of the global trends that will change the way they interact with their clients or customers. And, it will prepare them for some of the biggest trend drivers in the decade to come.